Saranda, also Sarandë (Albanish) is a cozy coastal town in Albania, only 20 minutes away by boat from Corfu, Greece. 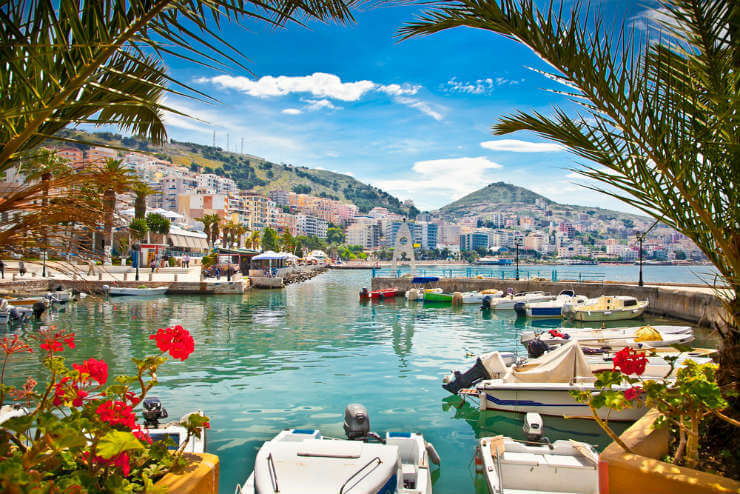 In recent years, tourism has flourished in Saranda and more and more have found their way to this hidden gem. The town itself is really nothing special, except that it is cozy, has good accommodation possibilities and many restaurants. But there are plenty of beautiful and nice places to visit around the city and Saranda is a good starting point. Ksamil is Europe’s newest strand pearl, and although more and more people find their way here, There are still plenty of places where you can be alone, and at the same time beaches with life and movement. Ksamil is, however, perhaps best known for its four islands that you can go by boat, but the other beaches are just as nice, I think. The sand is white; the water is crystal clear with a turquoise blue color. Take the bus from Saranda to Ksamil and jump off at the first stop in Ksamil (the bus goes from the center of Saranda and costs 100 lek). From there it’s about 500 meters to the beaches, if you want to explore a different beach, just continue along the mountain. A remote beach that offers snorkeling and tranquility with fewer tourists who find their way here, since the only way to get here is by walking, driving or taxi. The beach is located before Ksamil, and there is also a restaurant serving delicious fish and seafood dishes. Saranda and Ksamil are known for its large selection of delicious and especially fresh fish and seafood dishes. Besides that it’s delicious, the standard is also high, yet inexpensive. Butrint is about 40 minutes from Saranda by bus or car. The town was originally part of Illyria and the oldest remainings goes all the way back to 800 BC. Butrint was also once a part of the Roman Empire, and there are several buildings from this period, including the famous amphitheater. Butrint is since 1992 on the UNESCO list of world heritage. 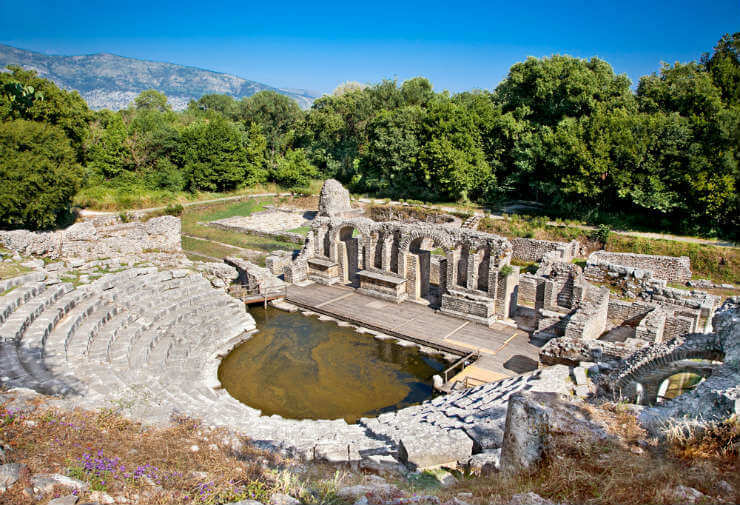 To explore the ancient ruins of Butrint is absolutely one of the must things to do in Saranda. 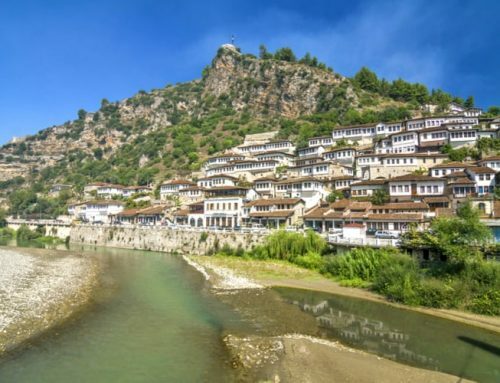 Do not miss to make a day trip to Gjirokaster, a world heritage site. Many of the rooftops of Gjirokaster are covered with stones, which give them a unique appearance. Adjacent to the city is also an old fort. 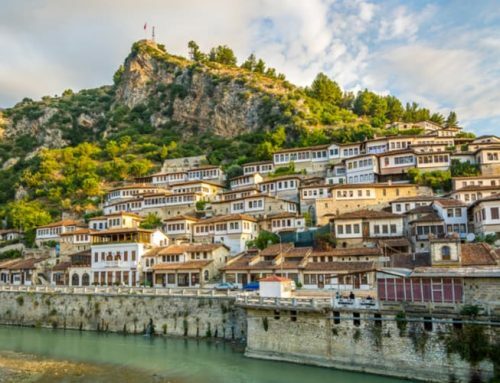 From the fort, one can enjoy a beautiful panoramic view of Gjirokaster. The easiest way to get here is by car or furgons (Albanian minibusses). 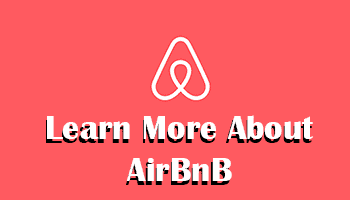 Otherwise, you can rent a car and take the opportunity to visit Gjirokaster after a visit to Syri I Kalter. From the center of Saranda, you can find several mini buses with daily departures to Gjirokaster. A lovely castle from the mid-1500s which sits on top of the hill, looking out over the city. From the castle, you get a great view of Corfu and Sarande. It takes about 40-50 minutes to walk up to the Lekuresi Castle from the Saranda, but it is just as easy to take a taxi round trip for a couple of hundred Albanian lek. A scenic area located about 30-40 minutes from Sarandë by car. A natural source of water in an almost magical blue/green color that is absolutely crystal clear. Look for the entrance sign to the left when you arrive. 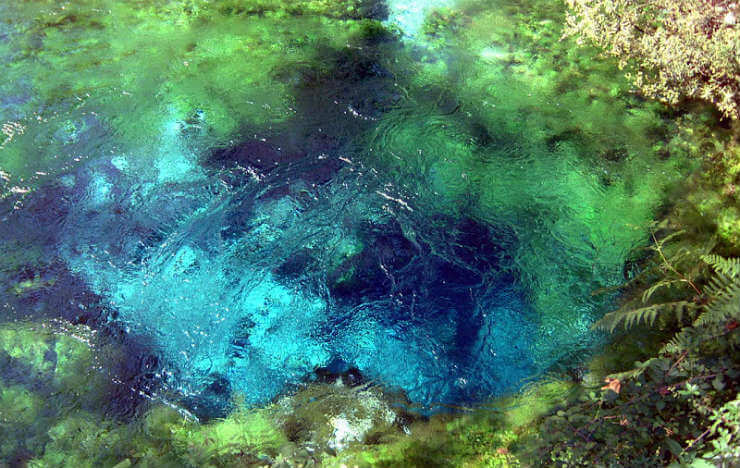 Syri I Kalter is also known as “Blue Eye,” because the illusion that resembles an eye by the water bubbles. The source is said to be 45 meters deep, but some claim that it is deeper than that. To get to Syri I Kalter, one can either rent a car or go on a guided tour or third option; taxi. A taxi costs around 30 euros round trip with a driver waiting for two hours. 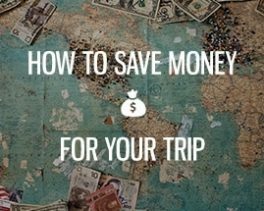 A rental car is the most affordable since you can visit more places on the same day, for example, Gjirokaster and Butrint. Most people tend to have one and another drink while on vacation and Jericho Cocktail Bar offers Saranda’s best and tastiest selection of drinks. The bar is located right on the waterfront, overlooking the harbor. Address: Rruga E Flamurit Sarande. Do not miss to take a stroll along the harbor of Saranda. Buy an ice cream and enjoy! (A double caramel magnum only costs 1 Euro).